Ms. Marie Jeanne, the resident representative of TDH, speaking. The donated equipment included a Bilirubin Meter, a Micro Haematocrit Centrifuge, four Baby Trolleys, three patient trolleys, and four major trolleys. 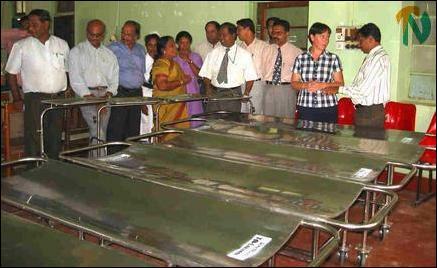 In an event held the hospital’s library, and presided over by Dr. S. Thevarajan, the director of the Teaching hospital, Ms. Marie Jeanne, the resident representative of TDH handed over the equipment. Mother-and-Baby care doctor, Dr. Shanthini Ganeshan, Obstetrical specialist Dr. Rudra, other doctors and nurses participated at the event. 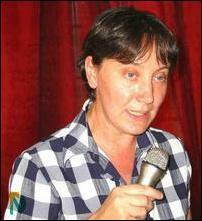 Speaking at the event, Ms. Jeanne said that her organization is involved in several projects related to mother and baby care in the Batticaloa and Amparai districts, with the focus on infants, and that her organization worked in areas controlled by the Liberation Tigers as well the Sri Lanka Army without problems. According to Ms. Jeanne, the TDH is working in 11 villages on the Senkalady-Badulla road, and 18 villages in the Paddiruppu region in the LTTE-controlled areas. In the SLA-controlled areas, TDH works in 3 villages on the Trinco-Batticaloa road and 20 villages in the Amparai district. In these villages, centers for baby’s mental welfare and mother-and-baby welfare have been constructed. Ms. Jeanne handing over an equipment to Dr. Thevarajan. “Based on the request of the hospital administration, we have made this donation to the hospital. In the future too, we will consider requests for equipment, ” said the TDH representative.